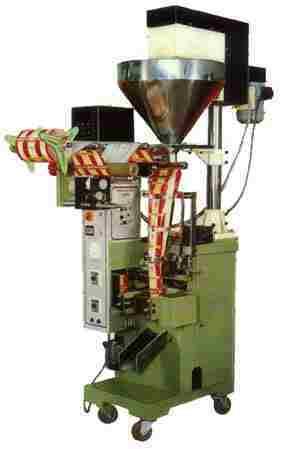 With print registration control system , conducts measuring, bag making , filling , sealing and cutting, all automatically. Easy to change for different pouch sizes. With Auger as feeding unit , the machine is suitable to pack all type of powders. Compact and easy to operate with all contact parts of stainless steel. Packing Material Any heat sealable laminated film such as Polyester/Poly, Paper/Poly,Glassine/Poly, Polyester/Met Polyester/Poly, Polyester/Foil/Poly, BOPP/Foil/Poly etc. Power Consumption 2.5 KVA ,3 Phase, 440 V.
4 Side Sealing 150W x 2 Nos.